I hope you are well, while 2017 is almost out the door, we have a release just out from Chvad SB. This time out Chvad is doing guitar drones in the style that’s been associated with Silber from the very beginning, more info & places to stream or download listed below. While we are always trying to get more out, we are pleased to say in the end we had 26 music releases this year (including 9 in our Christmas series), three mini-comics, & one issue of QRD. I have every hope that next year will be even more productive & with enough interviews for an issue of QRD, a half dozen records almost ready to go, & more than a dozen comic scripts waiting to be typed up out of my notebooks — it already seems promising. Thanks for all your interest & support & helping us to not only exist, but thrive in this era where so many labels are having difficulties. It really means a lot to both me & all the artists in the roster. 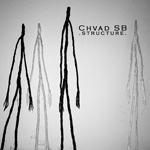 Chvad SB’s sonic experiments focus on new sounds & textures, but always with a human edge. On Structure we have densely droning stings & slide guitar for tow slabs of drone caught in an endless moment. This entry was posted in daily news, music and tagged chvad sb. Bookmark the permalink.